What a foray into the world of familiarship this has been! We've listed the types of familiars and solved the difference between a pet and a domestic familiar. Then we got right to the point by explaining the pact. From the ways your familiar will offer help to what you can offer in return, from the familiar in the context of ritual to whether you can have more than one familiar, and even how familiarship can extend past the death of your domestic, we've broke serious ground on what familiarship means and how to maintain it. 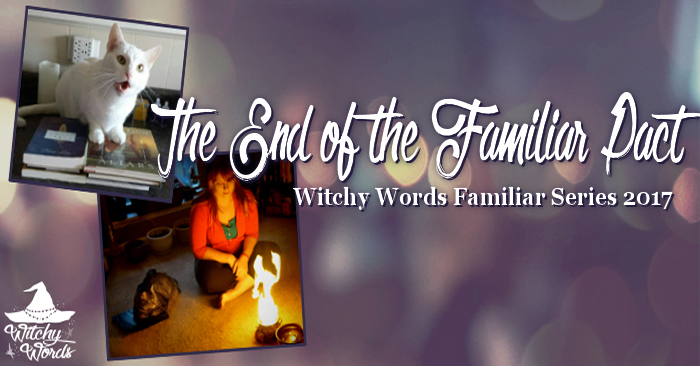 Unfortunately, this means we're at the end of the Witchy Words 2017 Domestic Familiar series. It seems only fitting that this last article discuss the end of the pact. Towards the beginning of the series, I spoke in great detail about the pact - a type of contract you form with your familiar and sign through ritual via either a gift, genetic, food or other such exchange. The pact is quite literally what defines a familiar - without it, you do not have one. It outlines what you will do for each other and creates stipulations each must adhere to. This pact is the essence of familiarship. This entire series has been written with the idea that you read it in its entirety before initiating a pact with your would-be familiar. And so, as we draw to the close of the series, we will talk about clauses that may cause the end of the pact - and just how to confirm the end of that magical contract. How long does a familiarship last? In my experience, familiarship typically lasts at least through the lifespan of the familiar. Of course, there may also be clauses within the pact you two create that terminates the contract if violated. Your familiar may insist that, should you abuse, neglect or starve them, the pact is void immediately. You may stipulate that, should you lose your ability to financially or physically care for the familiar's living vessel, the pact disintegrates. These aren't "when" clauses but rather "if." If ____ happens, then ____ occurs. If a clause is violated, then the pact is void. Such clauses could also be as simple as insisting that, should the familiarship not be agreeable for either party at any time, the contract is null. If your familiar is unhappy with the familiarship, or you're not getting what you need out of it, this could very well void it. I would suggest ensuring some sort of mediation before going that far. Familiarships, like any relationship or bond, have an ebb and flow. Periods of waning are bound to occur naturally and do not necessarily dictate the strength of the overall bond. But, if after attempting multiple mediation attempts, the familiarship simply isn't working, it's best to revert back to ordinary pet - for both your and your familiar's sake. Note that I'm not suggesting you give up your familiar if it's not working. I believe pets are for life. Once we commit, we are bound to caring for them. Familiarship is separate from the pet-owner bond, as we've talked about at length before. The pet-owner bond can continue, even if familiarship can't, and should only be severed in cases of abuse, neglect, starvation, financial or physical risk. If you find yourself suddenly in a position of being unable to care for the animal and there are no subsidies, shelters, rescue groups, family members, friends or other such assistance available to you to help you do so, giving the animal up to a shelter or another caregiver may become your only viable solution. You should never be guilted into keeping an animal that will be at risk in your care. But back on the topic: Domestic familiar pacts can often last beyond the familiar's life, turning a domestic familiar into a spirit familiar. This transformation from life to death should not alter the pact - unless you two decide it should. You may devise an entirely new set of rules as a spirit familiarship or you may decide the contract is void upon death. Some familiars may like to move on to the next witch in need, passing from one living vessel to the next. If they're tied to you, they won't have that option. Other familiars have work in the Other and this life was a temporary relief from that eternity. Or perhaps, on your end, you'd prefer to work with only living familiars or only one at a time. If you're uncomfortable with spirits, even if it was once your domestic familiar, then you need to make that known before initiating the pact. Whatever you and your would-be-familiar decide, narrowing it down prior to forming your pact is ideal. But what if you make it through the entirety of the familiar's life and death, and are still pacted? When does it end then? You and your familiar may decide that you're bonded for the duration of your life. If your familiar is willing to continue the pact as a spirit until you yourself undergo that transformation, then your pact ends upon your own passing. Another option, with caution, is that you may decide to pact for eternity. Keep in mind that this kind of forever pact should still include all of the same clauses and voids as any other one. It should also only be entered into with extreme trust. Finally, what if you don't want to answer this question yet? When familiarship is new to one, or both, parties, it may be difficult to plan that far ahead. Some familiars or witches need to experience the familiarship itself, that is fully initiating the pact and acting as a familiarship for some time, before deciding how long the pact would last. Though it makes it easier to enact, you don't have to have your entire familiarship mapped out in the pact. Everything I've spoken about in the past nine articles are simply suggestions, food for thought as you consider the idea of familiarship. It's entirely up to you and your familiar if the resolution of your pact requires ritual. For some, once the end of the pact has been agreed upon by both parties, the contract is void. Any further magical work together could initiate new work and, as you and your once-familiar are no longer bound anymore, that magic could be rendered ineffective anyway. That being said, we sometimes seek closure through ritual. Because your familiarship began with one, it would make sense if you wanted to end it with one as well. 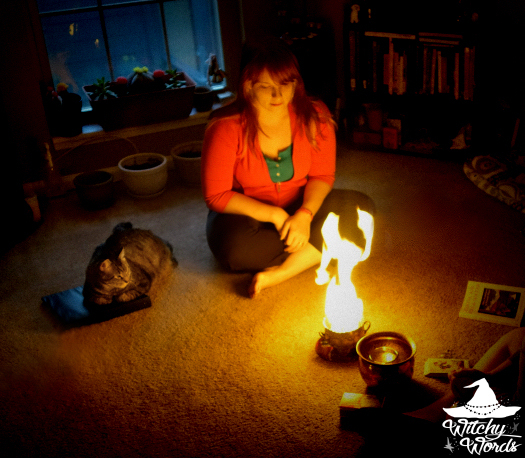 So, if you and your familiar agree a ritual is necessary, beginning at the end is the best way to start. Instead of strengthening the link, you will want to sever it. This can be done metaphysically via astral travel, a parting of ways in the Other or physically by cutting a cord that represents your bond. Next, you'll do a sort of "return" on your original exchange. If you two swapped gifts, now is the time to return them. If you two have taglocks, destroy them. Of course, if your exchange was of food, that's not something you can exactly give back after several years. There are a couple options you can pursue instead. If your familiar is no longer of the physical plane and your health permits it, a period of fasting could be put in place for the day of the ritual. If this isn't an option, you could make it a point to have obviously separate meals. Or you could have another shared meal but consider it the final meal of your familiarship. The choice is entirely yours. After that is complete, you should go through your pact piece by piece and dissolve it. This means backtracking through every agreement you made and ensuring that it no longer applies, whatever that means to you and your familiar. All of this should be contained within some kind of sacred space, of course. How you form it, though, is up to you. Some will cast the circle counterclockwise in a banishing or breaking motion. Some may cast the circle as preferred and then intentionally break it once the pact has ended. Others will maintain sacred space exactly how they do for any other kind of ritual. Whatever you're most comfortable with is the option you should follow. Again, while a ritual to confirm the pact is typically necessary, end of pact or breaking pact rituals aren't. What matters is that you and your familiar are in agreement, that the pact is, in fact, completely voided by whatever you two choose to do and that you return to separate, unconnected entities afterward. While this article is the end of the domestic familiars series, I hope this is the beginning of something new and exciting in your path as a witch! Familiarship is a serious investment of both time and energy, and can be extremely involved, particularly as your relationship advances over time. That being said, the rewards are worth the work. Every familiar I have has taught me something new about myself, my Craft and my abilities, showing me new paths to travel on. If you're willing to invest the proper amount of time, care, responsibility, energy and magic, familiarship can reward you with not just an entirely new Craft but a partner in the Craft as well. Thanks for this useful information. I have been searching for informations on familiars until I found this. You are very welcome! If you have any questions, I'm always happy to answer them. Thank you!